Episode Review: SPARTACUS: WAR OF THE DAMNED, "The Dead and the Dying"
With only one week left, Spartacus: War of the Damned stumbled a bit and put out an episode that brought the momentum to a halt while also being one of the more frustrating outings of the season. The rebels attacked a clutch of Roman soldiers that were coming from the north. It turned out that they were a part of a legion that belonged to another praetor named Pompey. When Crassus learned of Pompey's movement, he and his advisers thought that it was a power play to steal the glory. Sure enough, one of Pompey's messengers arrived to set up a meeting between the two generals, but Caesar suggested that Tiberius go in Marcus' stead. Everyone agreed, but it turned out that it was a trap set by Spartacus and his horde. 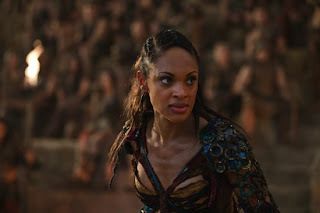 As it turned out, Naevia was spared and sent to the rebel camp with the head of Crixus to show Spartacus what Crassus was capable of. The freed slaves used the uniforms of Pompey's men to lure Crassus to his death but got his son instead. Since Tiberius was responsible for Crixus' death, Spartacus decided to sacrifice him and his men as tribute in gladiatorial games. Everyone got their chance to kill Romans, and Naevia had the honor of slaying Tiberius, but there was a catch. When Crassus learned of what happened, he sent Caesar to bargain for his son's life. The Romans would return 500 of Spartacus' men for Tiberius. The Thracian told Naevia that it was up to her and she spared the younger Crassus' life. It looked like the snake was about to get away yet again, but a distraught Kore stabbed him before he could leave the rebel camp and offered herself up as the new chip. When it was all said and done, Tiberius was dead, Kore was back with Crassus, and the former gladiators honored their fallen brothers and sisters. Thematically, I understood what the narrative was trying to say, and it should've been one of the more powerful episodes of the season since it dealt with saying goodbye to one of the most important characters the series ever had, but it didn't work structurally. The stretch where we saw the rebels execute the Roman prisoners went on too long and it took the wind out of the sails. Don't get me wrong, it was satisfying to watch Spartacus and the rest get some revenge, but we really didn't need the sequences to drag on or to see Lugo and Saxa kill nameless soldiers. On top of the excessive "games," we had to endure more Tiberius and Kore nonsense. For a second there, I honestly thought he was going to survive this episode and that prospect frustrated the living daylights out of me. Yet, his death was anti-climactic because Kore was responsible for it instead of Naevia. Now, I'm not a fan of either character, but having Kore be the one who took out Tiberius was kind of a waste. The pacing issues were not helped by the fact that we had to re-watch the death of Crixus. One of the 500 was Agron, who survived the battle and was crucified. While it was nice to know that he didn't die, his crucifixtion also felt a little pointless since he was released anyway. It was like DeKnight and Co. needed to nail someone to a cross because it's Spartacus. I'm glad that Laeta's bought into the cause. It would've sucked if she ended up being some kind of spy. Then again, who knows? And more of the Agron/Nasir/Castus love triangle. The final tribute was well done. All in all, I don't think I can say that "The Dead and the Dying" was a bad episode because it wasn't. It was just a flawed one at a time when Spartacus should be firing on all cylinders. Either way, it's hard to believe that it will end next week. Please don't go, Sparty!